Carolina Wrens are Cavity Nesting birds found in the southeastern third of the United States. They are common in the eastern half of Kansas and prefer areas with plenty of shrubs and thickets. You can often find them in backyards that provide plenty of shrubby habitat. It is important to provide an abundance of native plants that in turn will supply plenty of insects for these insectivores. Remember native plants provide food for our insects which in turn provide food for our birds. Carolina Wrens are also fond of spiders so having plenty of insects to feed the spiders is also important. I've never had Carolina Wrens nest in a conventional nest box with a hole. But they will nest in a box with a slot opening. They will also nest in dense vegetation and even in hanging planters. I place peanuts out for all the birds either on a table or a platform feeder. I also supply black walnut pieces in a hanging feeding container. Its best to serve very small pieces of peanuts or other nut meats as they have trouble breaking them into smaller pieces that they can eat. I sometimes put a handful of peanuts in the blender to chop them into finer pieces. They will also eat sunflower seeds but they are more difficult for them to crack open. Serving sunflower seeds with the shell removed is a better option. One of their favorite foods is homemade suet. It is made with animal fat, peanut butter, oatmeal, cornmeal and wheat flour. I serve it in a hanging suet log. Use my recipe for making Homemade Suet and you will be sure to get lots of birds that relish it. Meal worms are another food that are relished by Carolina wrens. I serve them in a little glass dish. You can get live ones or dried ones. I usually serve the dried ones as they are more affordable. Putting up a nest box for Carolina Wrens will likely entice them to nest if it is located on the side of a building under the eaves. The nest box does not have a hole but has a slot opening. The dimensions of a nest box are as follows. Base: 5 1/2" x 4"
The front of the nest box should open downward to facilitate monitoring the nest box. 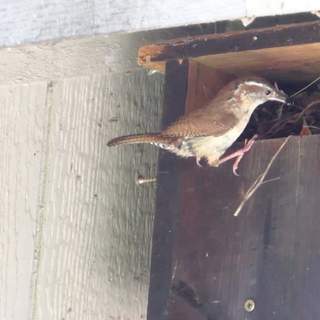 I'd suggest placing more than one nest box as you never know which box the Carolina Wrens will choose to nest in. Once your nest boxes are built, you need to mount them. Carolina Wrens prefer a nest box that is mounted under the eaves of a building. The nest box can be screwed to the side of any building under the eaves. They will also nest inside an open faced building - just attach the nest box on an inside wall. The height of the nest box should be about 5' or higher, basically just mount it the height of the wall you are mounting it on. Mounting the nest box on a wall also provides a site that is safe from climbing predators like snakes, cats, and raccoons. The nest box should not be mounted out in the open like nest boxes for other birds. The nest that they build is unusual compared to other cavity nesting birds. It is a domed structure consisting of a variety of vegetation such as leaf litter and grasses. It is important to leave plenty of dead plant material in your yard to provide nesting materials for Carolina Wrens and other birds. The European Starling and House Sparrow are both invasive non-native species of birds that compete negatively with our native birds for nest sites. Neither species is protected in North America. Both can be trapped and eliminated. 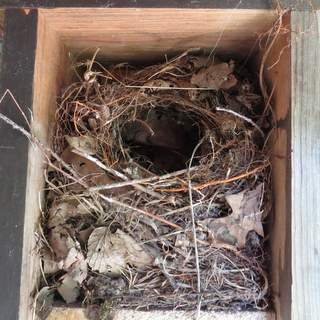 I've never had either species try to nest in a Carolina Wren nest box probably because the box is relatively shallow. European Starling Control details methods of trapping starlings. House Sparrow Control details methods of trapping house sparrows. In 2017 I had my first pair of Carolina Wrens nest in a nest box. They raised their first brood in a tangle of Virginia clematis in my Chokecherry trees. But they moved into the nest box for their second brood. They had 5 eggs and I saw at least 3 fledglings. Enjoy this video of the parents feeding the nestlings.